The Planning and Zoning Commissions facilitate city growth and coordinate property use in a manner that benefits and protects citizens and businesses. The purpose of the Master Plan is to provide a guide for the long term physical development of the City of Fayette, including the immediate environs outside the City. The City Planning Commission conducts business on an irregular schedule since the completion of the Comprehensive Community Master Plan under which the city is now acting. The plan provides guidance for land use, community design and zoning, recommendations for capital improvements in transportation and infrastructure, proposed community facilities and services, protection of natural resources, historic and cultural resources and, finally, recommendations for economic development and fiscal improvements that will result in continued and enhanced sustainable development of the City. You can read the Master Plan here. 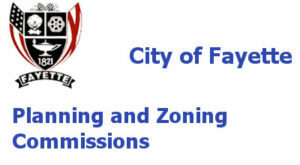 The Zoning Board of Adjustment consists of five members. The following links will display the ordinances regulating the zoning of the city and a detailed map view. This will display the Fayette Zoning Ordinance. This will display the Fayette Zoning Map.